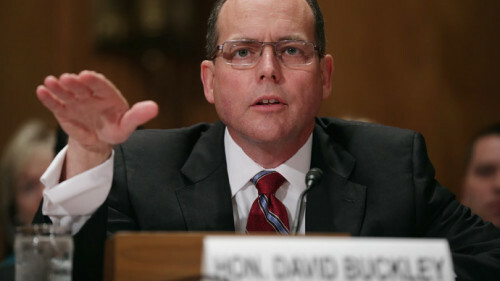 CIA Inspector General David Buckley, the agency’s internal watchdog, will resign at the end of the month, officials confirmed Monday, though they denied it had anything to do with the controversy surrounding the discovery that agency employees were hacking into computers used by Senate aides. Buckley’s office, which is tasked with investigating possible CIA malfeasance, found itself in the middle of a tense confrontation last year between the spy agency and the Senate Intelligence Committee, which was working on the now-infamous torture report. The inspector general found that CIA employees had gained access to computers used by Intelligence Committee staff members, confirming Democrats’ suspicions that the agency was attempting to prevent them seeing an internal agency review into torture and abuse during the Bush administration. CIA Director John Brennan then had to issue an apology over the hacking scandal, although he complained that the Senate committee was given access to documents it should not have been allowed to see. Buckley’s resignation comes amid a series of recommendations to prevent future CIA abuses from Senator Dianne Feinstein, outgoing chairwoman..